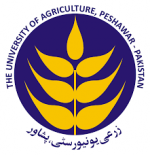 1Faculty of Agriculture, University of Poonch Rawalakot, Azad Jammu and Kahmir, Pakistan; 2Cereal Crop Research Institute, Pirsabak, Nowshehra, Khyber Pakhtunkhwa, Pakistan; Faculty of Agriculture, Gomal University Dera Ismail Khan, Khyber Pakhtunkhwa, Pakistan. Six maize (Zea mays L.) open pollinated varieties (OPVS) viz; PSEV-3, Azam, Sarhad white, Jalal, Iqbal and Pahari were used in this experiment to determine their combining ability through 6 x 6 diallel mating design. 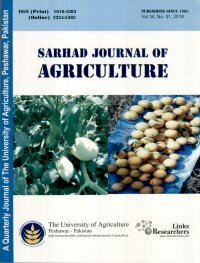 The research was laid out in randomized complete block design with three replications at Cereal Crop Research Institute (CCRI) Pirsabak, Nowshehra (K.P.K) Pakistan during the year 2015. The results displayed highly significant (P≤0.01) variation among above six OPVS for days to germination, plant height, leaf area, number of grains ear-1, grains moisture % at harvest, grain yield and biological yield. Mean square values due to general combining ability were highly significant (P≤0.01) for all the experimental parameters except grain yield and biological yield. Highly significant specific combining ability for direct and reciprocal crosses shows highly significant differences for all the studied parameters. PSEV-3 proved best combiner for days to germination and grains moisture % at harvest while Azam for grain yield and biological yield. Sarhad White was the best combiner for grain yield. 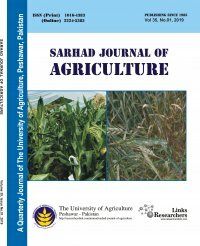 Reciprocal effects of Jalal x Iqbal exhibited best combination for leaf area and number of grains ear-1 while Pahari × Sarhad White for grain yield.